August 5, 1864. David Glasgow Farragut became a midshipman at nine and held his first command at 12. Despite a distinguished career dating back to the War of 1812, his birth (he was from Tennessee), family associations (he married twice, both Virginians), and long residence in the South made Union officials initially doubt his loyalty, despite his strong anti-secession sentiments. Eventually appointed to command, his triumphant victory at New Orleans in 1862 made him the nation’s most famous naval officer. Known for turning a handspring on every birthday, Farragut combined youthful enthusiasm and iron determination with a keen grasp of naval tactics and strategy. Farragut set his sights on Mobile Bay, the Confederacy’s last Gulf Coast port and a center of blockade running. Three forts guarded the entrance to a thirty-mile long inlet patrolled by a squadron led by the monster ironclad CSS Tennessee. A field of mines — known at the time as “torpedoes” — forced ships to enter the bay directly under the menacing guns of Fort Morgan. Success required a combined operation: Farragut would have to run the gauntlet of forts guarding the entrance and subdue Confederate ships in the bay itself while army troops attacked the forts from the rear. Farragut launched his attack in the early morning hours of August 5; four Union monitors, led by the Tecumseh, preceded his wooden-hulled ships into the narrow channel below Fort Morgan. Trouble began almost immediately when the Tecumseh, veering into the minefield to avoid running aground, struck a “torpedo” and began to sink. The ship’s pilot came face-to-face with Captain Tunis Craven at the bottom of the only escape ladder. “But,” wrote the pilot later, “there was nothing after me.” As he stepped off the top rung, Tecumseh and her gallantly polite captain disappeared beneath him. “Go on,” answered a powerful internal voice. Swinging his own ship, the Hartford, out and around the Brooklyn, Farragut brought her into the minefield that had just claimed the Tecumseh. “Torpedoes!” shouted those on deck. “Damn the torpedoes! Full speed ahead!” Farragut cried. As the Hartford surged forward followed by the rest of the fleet, sailors heard torpedoes scraping her hull and the snap of primers igniting them. None exploded. Clearing the forts, Farragut’s squadron squared off against Confederate ships led by the Tennessee, battering them into submission in just over an hour. Two weeks later, Union troops captured Fort Morgan, cementing federal command of the bay. The Confederacy lost its last key port on the Gulf of Mexico, leaving only Wilmington, NC, and Charleston open to the rapidly dwindling blockade running trade. August 1864. Historian John Stauffer writes, “That August Walt Whitman tried to capture the ‘terrible realities’ of hospital life by focusing on the fate of a young Wisconsin man, small and bearded, ‘a splendid soldier’ and ‘almost an ideal American.’ The man was a veteran of three years with only a few days to go before being discharged. While bringing in a wounded sergeant during a skirmish, he was shot in the knee. His leg was amputated and an infection set in. ‘Today the doctor says I must die,’ he wrote in his diary; ‘all is over with me — ah, so young to die.’. . .
“. . . Volunteers had dried up despite Lincoln’s call for another 500,000 men. . . . The Treasury Department had spent all its gold, causing greenbacks to fall to forty cents on the dollar. And everywhere people were clamoring for peace. Similarly, historian James M. McPherson writes, “The months of July and August 1864 brought a greater crisis of Northern morale than the same months in 1862. The theme of homefront war songs (which enjoyed an extraordinary popularity during the conflict, with sheet music selling millions of copies) took a sudden turn from ebullient patriotism to a longing for peace. 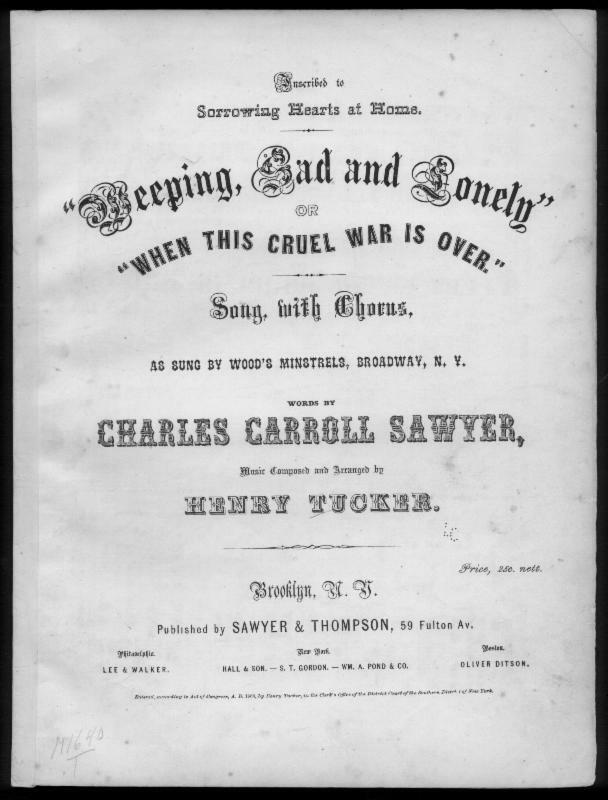 When This Cruel War Is Over, with its haunting refrain ‘Weeping, sad and lonely’ became the best-seller of 1864, while the chorus of Tenting on the Old Camp Ground seemed more than ever to echo Northern sentiment: ‘Many are the hearts that are weary tonight, Wishing for the war to cease.’ From the presses poured new songs whose titles hardly encouraged martial enthusiasm: Bear This Gently to My Mother; Yes, I Would the War Were Over; Brother, Will You Come Back? Tell Me, Is My Father Coming Back? John Stauffer, Giants, The Parallel Lives of Frederick Douglass and Abraham Lincoln, 276-77, quoting Whitman, “Specimen Days,” in The Portable Walt Whitman, 446-447; James M. McPherson, Battle Cry of Freedom, pp. 760-61.